Yesterday was Labor Day. That meant I was at home doing anything besides labor. (I actually got quite a bit done). But it also means that I didn’t post a Monday Brews article. Well, today is the Tuesday after Labor Day and I am calling it “Redemption Day,” as I attempt to redeem for the lack of a Monday Brews article. Leinenkugel’s Oktoberfest: Tis the season when the weather changes and Oktoberfests become my go-to brew of choice. New Glarus Staghorn: This is one of the best, if not the best, Oktoberfests out there. Just plain awesomeness in a bottle! Ben Franklin’s Honey: I think there are only three bottles of my second homebrew remaining. I’m not sure if that’s a good thing or a bad thing. Redd’s Strawberry Ale: The first entry that doesn’t quite seem right here. Over the weekend I saw one of these in my parent’s fridge and figured I should try it. It was VERY sweet and VERY strawberry. It didn’t taste alcoholic at all (and probably wasn’t very alcoholic). If nothing else, it was an interesting taste experiment for my tongue. Bud Light Lime: Another intriguing outcast that makes the list this week is Bud Light Lime. I’m not sure what happened. One moment I was enjoying a nicer beverage while partaking in a fantasy football draft and then all of a sudden a Bud Light Lime shows up for consumption. I’ll blame the Bud Light Lime if my fantasy football season goes awry. Leinenkugel’s Summer Shandy: I couldn’t let that list end with an Anheuser-Busch InBev product. So I finished the weekend strong with a nice refreshing summer brew. The Summer Shandy has had a good run. Unfortunately with the weather cooling down and the leaves thinking about changing colors, this product probably won’t be making this list again for a few months. See you next summer, Summer Shandy! The Little Prince: For future reference, this will likely make this list often over the next few months. So good! Dungeon Roll: This one will also likely make this list often over the next few months. I played it with my 4yo daughter and let her pull all the treasure tokens out when I earned them. Then at dinner later in the week she was playing with her food and having me “roll” it. Then she would decide whether it was a treasure chest or a monster. There were many more treasure chests than monsters. Prototype components for The City Beneath. The City Beneath: This is my friend Adam Buckingham‘s game based on his novel by the same name. It is a steampunk heist game that very much revolves around the different abilities of the characters. In the game you are trying to get away with the heist while making other people take the blame. It’s still a prototype but it is really enjoyable and I hope he keeps developing it. It definitely has legs! Mars Needs Mechanics: I’m interested in learning about the original theme of the game. I wanna say it was an African black market or something along those lines. We had a good time playing the game, though we stretched it to handle 5 players instead of the box-recommended limit of 4. The economics of the game are very interesting and the art is very enjoyable. Nicely done Ben Rosset and Bryan Fischer! Skyline: This could be the go-to filler du jour for a while. It comes in a small box, has awesome dice, and plays relatively quickly. And I think the gameplay is pretty interesting as well. There is a high reward factor when you can top off one of the sky scrapers! Tsuro: It seems my list is populated with filler material lately. This game is fun and plays very fast. Scoville: I was able to teach the game to two different groups at my FLGS on Saturday. Two people in the second group said they loved it and would have bought it if it had been on the shelf. At that point I let them know that it will likely be on Kickstarter in November (so keep your eyes open for that!). They also received the buttons that Ken Grazier produced for me! 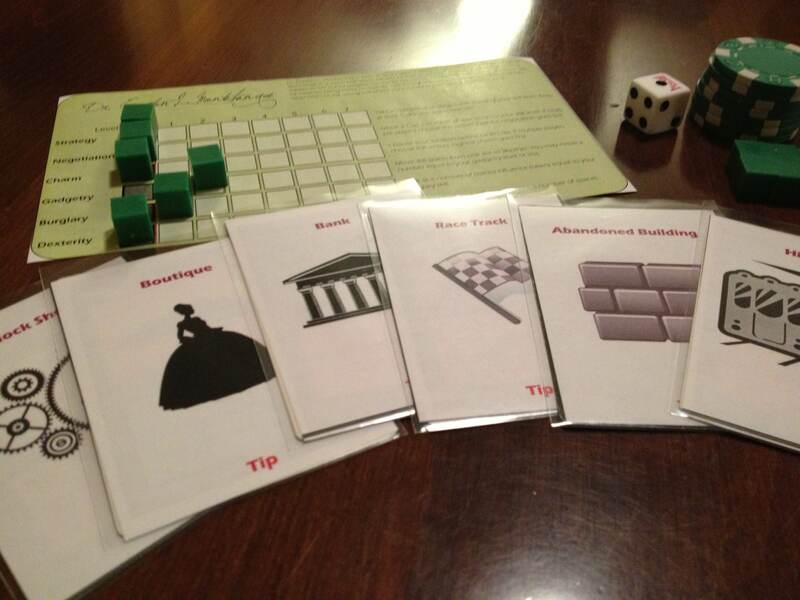 MarsPost: This was an unpublished prototype that I had the chance to play. It’s a very interesting take on worker placement. The concept is you are mining asteroids from the asteroid belt and utilizing a post on Mars to turn the resources into buildings and thus points. While it is a little rough around the edges I very much enjoyed it! That’s the weekly Boards & Barley. What was your favorite beverage or board game this past week?? Posted on September 3, 2013, in Monday Brews, The Barley, The Boards and tagged beer, board games, gaming, Monday Brews, Scoville. Bookmark the permalink. Leave a comment.